"relativ niedrige liegegebühren geg. zb kroatien"
Read morephine, Rochen, Fische ...). Die kleinen Buchten und Häfen haben noch großteils ihre Ursprünglichkeit." If you are planning a yacht charter in the Ionian Sea, Lefkas Marina is an ideal place to rent your bareboat sailing yacht. The Greek name for Lefkas is Lefkada - the town still bears the marks of the numerous peoples who passed by here, from the Venetins to the Ottomans. A great place with a stunning natural setting and plenty of history, not to mention a touristic pedigree that goes back hundreds of years. Start your yacht charter Lefkas from the modern Lefkada Marina that offers reliable and attractive boat rental opportunities. Lefkas Island is one of the most popular locations in the Ionian Sea, on Greece's west coast, connected to the mainland by a narrow causeway and also a floating bridge. In the north part of the island the yacht charter tourist can find the city of Lefkas (Lefkada in Greek), which has a strong tourist tradition. The town acts as prefecture and capital city to the region which bears the same name, making it the most important on the island, and not just for yacht charter visitors. Incidentally, it's also the largest town on the island. Travelling is made easy for any yacht charter group due to the proximity of the Aktion National Airport, a 20-minute ride by car. This airport has permanent flights from Olympic Air and Air Berlin, but you'll find that during the summer months it also gets flights from Austrian Airlines, Transavia, Sky Airlines and Viking Airlines. Being the capital city, Lefkas also has good connections with the neighboring region by land and sea. The main route in by car is the Greek National Road 42 which is connected to the E55 road for yacht charter people coming in from foreign countries. There is also bus access available from Athens and a marina which offers plenty of transit berths for yacht charter visitors coming in by water. Ferry runs can be made to neighboring Nydri and then take a bus back to Lefkas. If you hired your boat in another harbor and appraoch Lefkas sailing coming from the North, you need to find the entrance to the canal that cuts through the damm. Once you are in the canal, you need to wait until the bridge moves aside, so you can pass with your boat. The town of Lefkas and its Marina is situated around 1 mile south of the bridge. Many of the yacht charter crews visiting Lefkas say the canal and Gyra are one of the most beautiful parts of town, the Gyra being a long narrow strip of white sand which borders the crystal blue lagoon. This part of the town is also the perfect place to visit if you're into bird watching as herons, swans and wild ducks and geese all nest here. Other places of interests include the archeological museum, the folklore museum and the museum of photographs where you can find lovely souvenirs of the sunny yacht charter resort and other places on the island. You'll also appreciate the Santa Maura Castle and the numerous monasteries scattered throughout town, some very old. 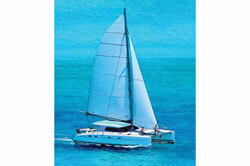 There are around 10 yacht charter companies offering more than 150 yachts for rental. 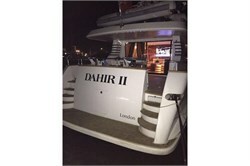 Most of the charter piers are in the Lefkada Marina that provides one of the best Marina services in Greece. During summer many Greek boat rental operators move a part of their fleet to Marina Lefkas because the demand for boat rental is big. 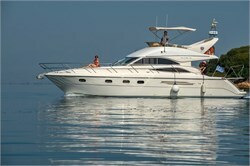 It is no wonder because from Lefkas yacht charter is very popular. When sailing from Lefkas you can sail north to Corfu, Preveza or lovely Paxi island. Other boat hire parties prefer the southern Islands of the Ionian. There they find the most stunning beaches and bays of Kefalonia, Zakynthos and Ithaka. Not for nothing, one of the most search terms in the internet related to yacht charter in Greece is "charter lefkada". The good news when it comes to eating in Lefkas is that you'll find a price for every pocket. But the main ingredient here has to be the fresh fish served in a variety of combinations at the numerous restaurants around town. If you like the nightlife, then you're in luck, because Lefkas is the capital of nighttime entertainment on the island. Just like in many other places in Greece, the yacht charter sailor can find lots of bars, clubs and live music venues which are open until the early hours of the morning. As far as events go, Lefkas has the customary religious holiday, always held in high regard in Greece, but there are also lots of cultural festivals, especially during summer which are used by the local authorities to showcase the local traditions to yacht charter visitors. Also, you'll be happy to know that Lefkas is also a place where water sports and sailing are held in high regard. In July, there's the "Watersports Ocean Festival" and in October there's the yearly regatta which attracts boat rental parties from all over the world.